As soon as I heard about it, the idea of a Finnish winter race organised by a Catalonian who I met in Alaska appealed to me. 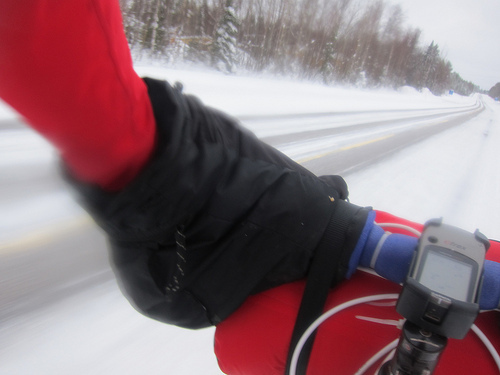 Of course, the random nature was part of the charm, but riding my bike 150km on the edge of the Arctic Circle also sounded like a fun thing to do. To me at least. 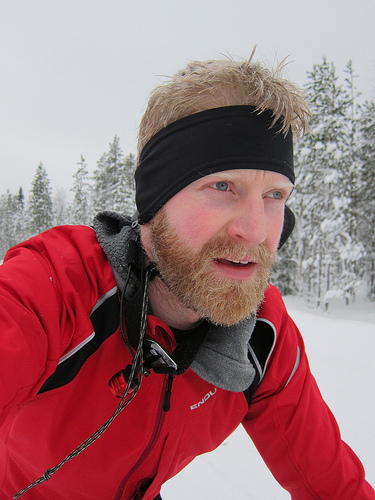 Straight away I booked flights for the inaugural Rovaniemi 150. The first incarnation of any event is always a step in to the unknown but it was obvious that Àlex, the organiser, was determined to make it a very special race. In winter racing, the trail conditions have a huge influence on you speed, much more so than in the summer. I was reassured to see how much work was being done to prepare the trail. Then, a week before the race, the temperatures soared and it started to snow. This was not good news for the bikes- super cold weather means the snow freezes nice and solid, providing a good riding surface. Fresh snow means pushing. 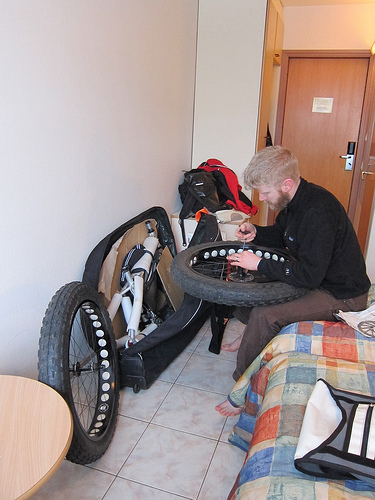 Rather than worrying about the weather, I did my best to refine my bike and equipment. I built my One-on Floater prototype with nine speed X0 Gripshift, Gore cables and cable brakes. Not the latest stuff, but nice and reliable. Alpkit sorted me out with a custom frame bag and a sleeping bag. Endura helped me refine my layering system. Compared to the other racers, it was clear that my set-up was a lot more minimal. Less to carry would be a bonus. The start line was brilliant. Situated by the main hotels in Rovaniemi town centre, you could see the course drop on to the frozen river, under the main road bridges and onwards in the wilderness of the Lapland forests. As I waited around for the mandatory kit check there was time to survey the terrain. The river looked barely rideable. I hoped it would improve as we moved North. The start was far from hectic. Nobody seemed to want to take the lead, so I did. Even within the first few hundred metres the field had already strung out, never to come back together. The first few miles were relatively quick going and as we rounded the first corner in the river, I was one of three riders at the front: myself, Elias and Martin. Soon the other racers were out of sight. I didn’t realise at the time but I wouldn’t see them again, and none of them would complete the course. The first checkpoint came at 10km. By this stage the trail had deteriorated slightly, so we were on and off the bikes and our average speed was dropping. I always want to estimate how long a ride will take me. This was a hard one to work out as parts of the course were on fast ice roads, while other sections would be slow going. I did my sums, the pace we were setting meant we were on course for an 18 hour finish time. Slower than I would have liked, but not so bad. As I trudged on I watched my average speed drop further. Eventually it got to the point where I was only just within the maximum finishing time allowed. At this stage I turned my GPS off. I knew I could make it round and I intended to no matter how long it took, so why think about it? The flipside of that thought was the fact that I was currently in 3rd place. What about everyone behind me? The runners must be moving faster than me in the deep snow. Perhaps they’ll catch me? Every so often I’d check over my shoulder, but there was no sign of anything other than the expanse of forest. After several further hours of pushing I finally reached tarmac, well ice-covered tarmac. Riding was a nice mental boost and a few miles passed quickly. I caught and passed Martin as he fiddled with his bike. Seizing the initiative, we both went the wrong way. Thankfully, I soon got us back on track, but then the pushing started again. And so it went. Time went by and I trudged on. It’s an odd feeling being alone in the dark, slowly moving though snow-filled forest, miles from home. Somehow I’m fine with it and happy to immerse myself in my thoughts. No iPod. No distractions. I don’t even know what I think about. Just keep on keeping on. At this stage I had my only kit problem. Stupidly, I managed to rip the cable out of my prototype head torch. Thankfully I had a spare, but at the rate I was moving I knew that, even on low power, I didn’t have the batteries for it to get me around the course. I opted to run the light flashing to conserve as much life as possible. In the deep snow I seemed to be faster than Elias and Martin. When the going was easier, they were quicker than me. Just before the half way point we all came together. The company was nice for a while, but then I let them go on while I slipped back in to my happy place. Alone in the dark. At the half way point, we all came together again. By now the hours of riding with only a flashing light had got to me and I had a splitting headache. We huddled around the fire and filled up on water. I let the others go and opted to sleep for an hour in an attempt to sort out my headache. When I awoke the headache was gone, but so was the trail left by the others. It had been snowing heavily for several hours and the wind had filled in any sign that people had been through before me. The way forward was now covered with thigh-deep snow. Progress was very slow. Perhaps one mile an hour. At least, when you are that low in the snow, you are fairly sheltered from the wind. Eventually I reached the longest road section of the course. I shifted in to the big ring and put the hammer down. By now it was the early hours of the morning, so despite passing some houses there was no movement. Moving back on to fresh snow, I noticed that there was only one fresh set of tyre prints. Was someone really far ahead or had someone stopped? My answer soon came when I spotted Martin behind me. He had got lost. By the penultimate checkpoint I had dropped Martin again and was only 20 minutes behind Elias. I carried on and soon caught him. We managed some riding until we got to the final lake crossing. The wind was high and the snow waist-deep in places. This was the only time in the race that I got cold. The wind chill was very high. At one stage a local skied out to make sure we knew what we were doing. “We’re in a race”. I’m not sure he was convinced. I’m not sure we were. When we eventually reached the far shore of the lake, we met a smiling Martin riding on the road. It turned that out by the time he had reached the previous checkpoint, he had been told the lake was too dangerous. Elias and I totally agreed it was annoying that we had spent that much time and energy doing it, but the three off us carried on together. A short road section gave us confidence. Unfounded confidence. Soon we were back pushing. Perhaps 20km from the end we met Simon, the event photographer, coming the other way on a snowmobile. He told us about the carnage behind us. We were the only racers left- everyone else had quit the race before the half way point. One Italian runner had to be rescued and was in hospital. Perhaps sensing the win, Martin made a break for it. The final 12km was a return leg on the river. By the time Elias and I got there, Martin had built up a decent advantage over us. Slowly we closed the gap. Just before we caught him, I popped. Elias kept going and took a deserved win. Thankfully Martin seemed to bonk as well and I got the better of him. After 32 hours, it practically came down to a sprint. A crowd of spectators and the other racers lined the finish. The weight of the hours racing lifted from my shoulders and I cracked a smile. 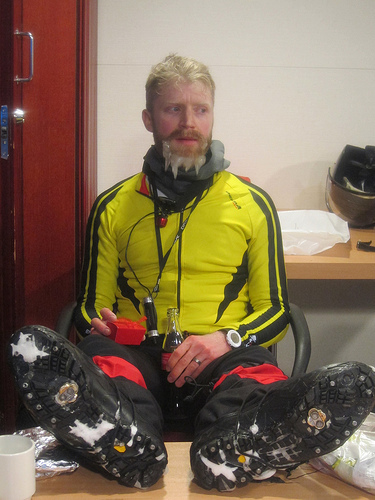 It was only then that I realised that my beard was a block of ice. We were ushered in to the hotel for the prize giving. After the hours alone, the bemused looks from the guests was priceless. My prize? A nice trophy and entry for next year. Will I be back? Hell yeah!